Zenon comes down with Prince Homura only because he dislikes the evil monsters and spirits. His revolving 'Demon Blaster' destroys dozen of monsters. His right eye is covered by the patch. 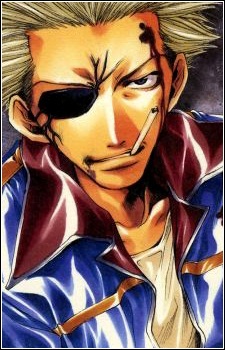 It is revealed that the eyepatch is his demon limiter, and he goes berserk without it. Zenon agrees to follow Homura for multiple reasons. One being he is sick of his life in the heavens, and is sick of living in general, another is that he wants to find the demon who killed the mother of his son. Years ago, Zenon went freely between earth and heaven (the year was not specified in the anime). He had relations with a woman who became pregnant with his son. The gods found out about this, and Zenon agreed to give up his immortality and live as a human. However, one of his subordinates (who was a demon), was told to bring her to the heavens, and killed her instead. He wields a banishing gun like Sanzo, only his has the form of an assault rifle. He dies in battle against Goyjo and Hakkai towards the end of Saiyuki Gensomaden.